The only way to build a long lasting business relationship is to ensure that both parties get benefits from that relationship. Gohar’s industry experience and refined business structure, ensures that we can provide a service that will benefit both parties. A commitment is a commitment. If we offer a service – then that service will be provided: on time and without compromising on quality! Gohar Textile is a fully vertical set up. Its main asset is its valuable customers and dedicated employees and our customer retention is 100%. The Gohar Group is completely self financed so assuring its sustainability without incurring heavy financial costs. Due to its financial strength, the company holds stock of 12 months of cotton. This helps in consistency of quality as well holding of Prices for a longer period of time. The company is holding good amount of Greigh fabric stocks in conventional fabric for a quicker shipment lead time. Gohar is expanding and investing in value addition ; automation ; capacities enhancement to cope up future challenges of time. It is investing in New software’s like SAP to increase work efficiency ; cost savings and smoother communication. We can boast of a huge 100,000 square metre manufacturing facility in Pakistan– we provide a complete vertically integrated manufacturing capability for a wide range of home textile products. We have over 32,000 spindles with production capacity of 660 tonnes of Yarn per month. We have a very in-depth quality control system. We procure the finest quality cotton available in the market and ensure this by testing the cotton in our latest quipped Lab through HVI module testing system. The staple Length of cotton fibre is checked and assured this meets the standards. This means that the fineness of cotton fibre is assured; uniformity between fibres is checked; colour grading of fibres in cotton for assuring even dyeing of the fabric. We measure short fibre Index for assuring maturity of cotton fibre. Polyester fibre is also checked to maintain the quality. We have the facility of online yarn monitoring system which assures best quality of yarn according to customer requirement. This system is not commonly available in market and we are one of very few who have this system in place. At the moment, we are manufacturing yarn in different innovative blends like Lyocell Cotton; Bamboo Cotton; BCI Yarn. We have 1,700 weaving machines with the capacity of 6,020,000 meters per month — 200 Air jet loom machines with capacity of 2,200,000 meters per month; 500 Sulzer loom machines with capacity of 2,250,000 meters per month; 1,000 auto loom machines with capacity of 1,570,000 meters per month. Recently, we added a state-of-the-Art air jet loom weaving unit. We are fully capable of weaving higher thread counts; textured fabrics, including all type of weaves and yarn blends like Lyocell; Bamboo; Egyptian and many more. We have both continuous and kier bleaching and our capacity is 150,000 meters per day. We also have state of the art design and development studios. These studios are well-equipped with Latest designing softwares, techniques and creative team members. We also take regular inputs from international Design houses to keep us updated with prevailing trends. We have a brand new digital printing machine with working width of 3.2 meters. Digital printing helps in achieving the details and definition of designs. A minimum of three samples are taken from every 3000m of textiles produced, which is then taken on to be tested for construction, composition, thread count, GSM, Tegewa, absorbency, PH, Pilling, skewing, bowing, whiteness, wet and dry washing and rubbing analysis. Our company performance projection for 2017-18 is $98 million. 2 Reggiani printing machines with 15 colour options and 3.2 meter working width. All standard design repeats and mesh categories possible. Capacity: 100,000 meters per day from both machines. Mercerizing machine with capacity of 45,000 meters per day to make ready for re-active dyeing. 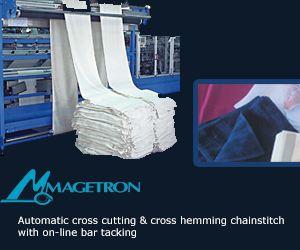 Sanforizing machine used for the stretching of the fabric which helps to prevent shrinkage. Capacity – Calendar 150,000 meters and sanforizing 100,000 meters per day.